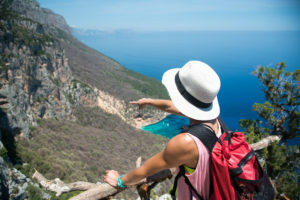 Other places have better architecture, food, history and a diverse feel but, if you are looking for the best coastlines in Europe, head for Sardinia.” You can swim, canoe, dive and sail around the island all year. The interior of the island is less developed, and has an unspoilt beauty, like that of Scotland but with a more decent weather, and offers great cycling, rock climbing and walking as well as glimpses of a fascinating prehistoric culture. The weather is very mild (see Sardinia and Ogliastra’s climate) . Overseas, Sardinia is known for the expensive Costa Smeralda, while the reality is very different…”the light, the smells, the beach,…” and it’s not expensive. The Regione Sardegna has been busy promoting the island, including this great promotional video whose cover photo is shown on the left, click here for iPod version. In our own part of the island, we found ourselves describing Sardinia’s charms on a RAI International documentary (not available for iPod) filmed in December 2009 when Johnny Dawes and Julie Hiam stayed with us at The Lemon House and we happened to be at the Bar Belvedere in Baunei at the same time as the TV troupe.It might be frustrating, but the perception that Sardinia offers only beaches as he responds to the journalist’s questioning, “Can you climb here? Really? But it’s too hot in summer, no? !” while Johnny and Julie (11:30-12:50) do a great job of explaining how what Sardinia is really like. Ogliastra is a province in the east of Sardinia which combines mountains rising to over 1000 m within 20 km of the beautiful sea. The region is the least developed in Sardinia and is still very unspoiled, as described in the book “Gennargentu Man and Nature” (see cover photo) with lovely photos which you can browse or buy from us in The Lemon House. Ogliastra is the most mountainous province in Sardinia and also the least populous, with only 58,389 inhabitants as of the 2001 census. A couple of very good sources of information in English for visitors are the web site of the Sardinia Region (in English)and of the Province of Ogliastra. In addition to its stunning natural beauty, there’s Sardinia’s fascinating culture to discover, of which the inhabitants are justly proud. The island has it’s own language, Sard, derived directly from Latin (it’s NOT a dialect of Italian) and spoken above all in the mountain towns, one of Europe’s most well-developed Bronze age cultures with more than 7000 archaeological sites all over the island, enduring pagan rituals, and popular festivals. The whole of Sardinia, and Ogliastra’s no exception, is full of archeological remains from the Bronze age. Hunter-gatherer people lived in little castles called nuraghe, 7000 of whose remains are dotted all over the island. We were so struck by this fascinating history that we included in our logo (see our banner) the “bronzetto” from Abini, a warrior with 4 arms and 2 shields, a large steel replica of which can be found in Tortolì and which is also used by Crocchias as the logo for their tasty crisps shown in the photo. You can see Bronze Age graves “domus de janas” at a spot only 3km from The Lemon House in Lotzorai; and there are many nuraghe and other sites only a short distance away from where we live. The island’s distinctive culture includes as well summer festivals, traditional and modern, organised for the “foreign” tourists and Sards working outside the island who come to see their families during the summer holidays. Some of these are festivals for patron saints, such as San Cristoforo in Lotzorai. The procession comes along via Dante in front of The Lemon House as shown in the video on the left. Our downstairs neighbour in Porto Frailis is from Mamoiada and has performed as a Mammunthone in processions such as the one in Tortolì at Easter 2007.